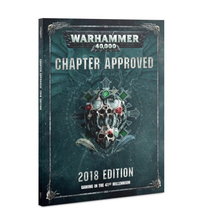 27.08% of people buy Warhammer 40,000: Chapter Approved 2018 and Warhammer 40,000: Imperium Nihilus – Vigilus Defiant. Games Workshop should be commended for their recent commitment to trying to ensure balance in their game. This is the latest update for things like points cost in order to keep battles between armies fair. As such it is a necessary purchase for players. Mighty Ape's service was excellent. Thank you. "Great for more than just points"
A compendium of gaming material for use in your games of Warhammer 40,000! Supports Open, Narrative, Matched Play Games, Updated points values for Citadel and Forge World miniatures.